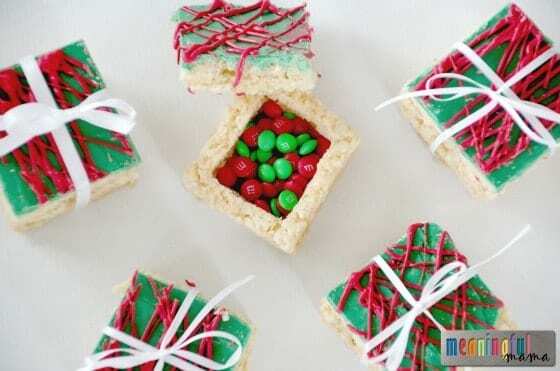 Rice Krispies® Treats are a fun dessert to make any time of the year. It is a simple food that creates open-ended possibilities. You can see my turkey treats, spring flowers, Rice Krispies® Treats in an Easter disguise, or our favorite and easy Rice Krispies® Treats ice cream. Now that Christmas is quickly approaching, I wanted to come up with a fun and unique idea to celebrate this beloved treat. 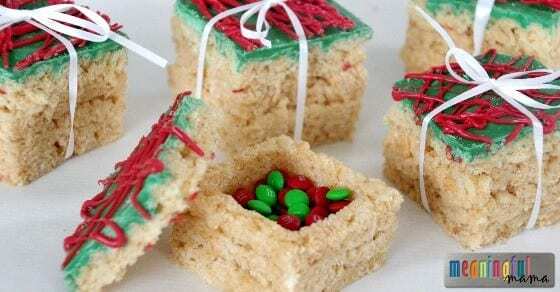 These Rice Krispies Treats Presents with a Surprise are sure to delight the oldest, youngest and everyone in between this Christmas. I also want to let you know that Rice Krispies® is partnering with Toys for Tots. They will be giving away holiday toys to children in need – up to $50,00! How cool is that? I love to be able to support generous giving this holiday season. Make sure to participate in this promotion using the hashtag #treats4toys. 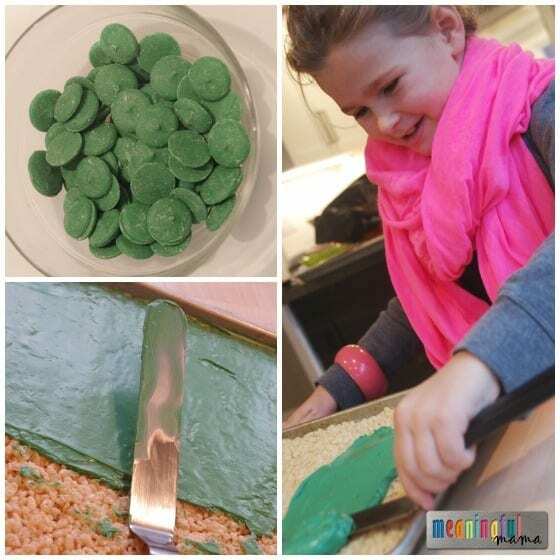 One of the things I love about this creative food idea is that kids can help with every step. It’s a no bake idea and is easier to create than it might at first seem. Everything is done in the microwave, and I’m going to give you step by step instructions to make it happen. It’s easier than it looks. I picture these given as classroom treats for students or teachers. They could also be part of your table setting as you gather to feast together. Perhaps you could deliver them to neighbors to spread Christmas cheer or invite them to a service at your church. Maybe you are a man looking for a creative way to propose to his sweetheart this season. 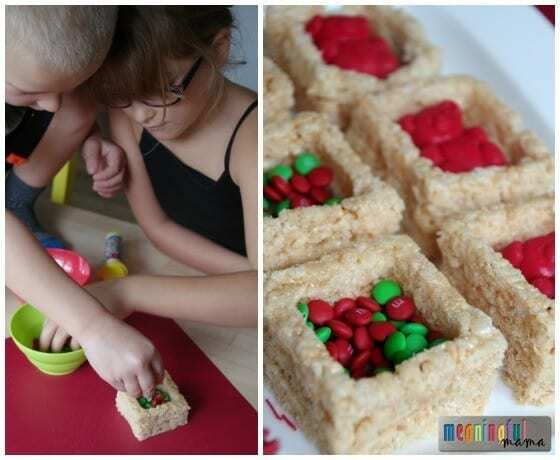 Whatever the purpose, these little edible surprise Rice Krispies® Treats presents will be enjoyed by many. These can also be adapted for any time of the year and filled with any number of candies or surprises. 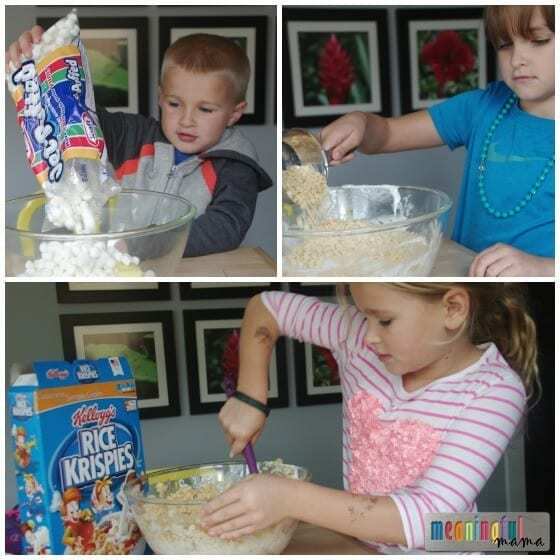 Remember that the base Rice Krispies® Treats is a 3-ingredient recipe AND can be made in the microwave. I’m adding a few more needed ingredients to spice things up for the holidays. 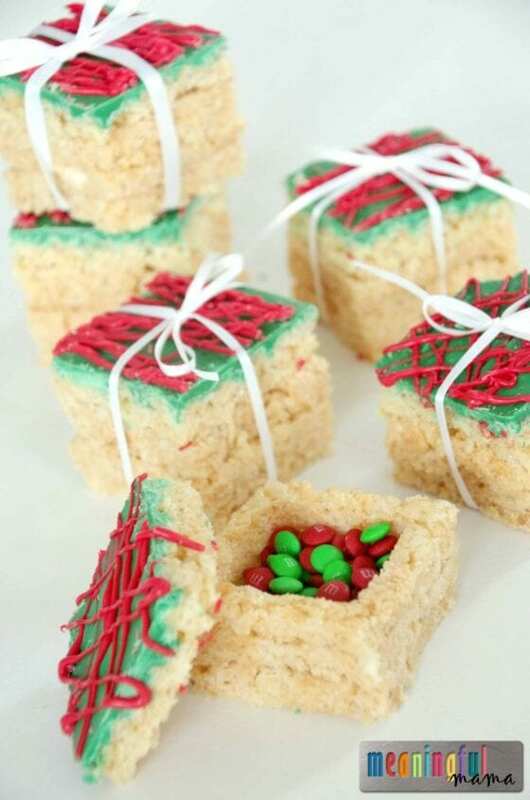 This recipe yields 8-10 Rice Krispies® Treats Presents. Make sure to have your kids helping with every step. The chocolate covered Riced Krispies® Treats require a bit of pressure, so you might need to help a little with that step. 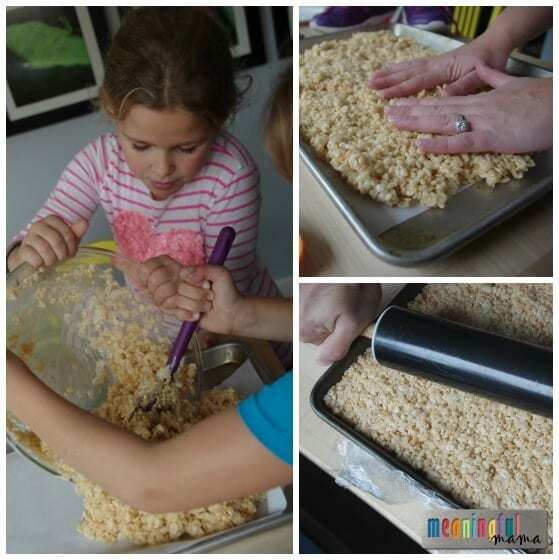 Make two batches of Rice Krispies® Treats according to recipe directions. The only change is that you will put your treats in a parchment paper lined jelly roll pans rather than the typical 9×13. When adding them to the pan, put Crisco on your hands to prevent sticking. Once spread, you will want to use a rolling pin to roll these to about an even 1/2 inch thickness. One pan should be full and the other pan should be 1/2 full. Allow Rice Krispies® Treats to cool completely. Melt green candy melts according to package directions. I do mine in the microwave, and it is easier than it looks. Once melted pour green chocolate over the jelly roll pan that is half full of Rice Krispies® Treats. Smooth with a spatula. Put in the refrigerator to harden. With the other tray of cooled treats, use the large square cookie cutter to cut out the base of your box. Next, cut out another large square. Centered in that square, cut out a small square. You should have a picture frame looking piece that will go on top of the base of your box. Repeat. You will need two of these per box. Stack these 2 “picture frame” pieces on top of your base and press slightly as you go to bond to the piece underneath. Repeat this process until you have all of your boxes in place. Remove the green chocolate covered Rice Krispies® Treats from the refrigerator. Using the large, square cookie cutter, cut out the lids for your boxes. This step requires a bit more pressure, so you will have to help the kids. Another option is to press in the cookie cutter to give the size and then use a knife to cut the rest. Melt the red candy melts according to package direction. Using a squeeze bottle, pastry bag or ZipLock page with a hole cut out of the corner, squeeze chocolate, quickly moving back and forth and zig zag to create a design on each individual chocolate lid. Note: You might be tempted to do this before you cut the chocolate into individual squares. I did this, and I had to redo many of them because the red chocolate wanted to break off in the cutting process. I highly recommend doing them individually. Fill box with desired treat. If filling with something inedible, make sure to warn the receiver of the gift so it is not swallowed. You can fill the boxes with small candies, an edible chocolate made from a mold, a piece of jewelry, a small ornament, an encouraging quote or scripture, or another small gift. As you can see, we made some with small candies and others with little, chocolate teddy bears. Once boxes are full, add the lid to the top and tie in place with a thin white ribbon. 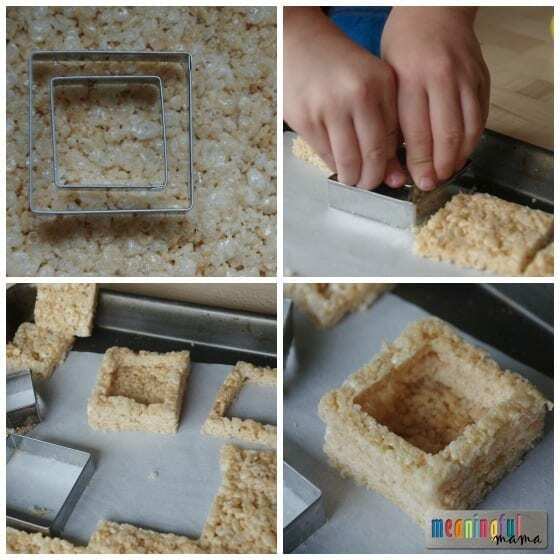 I hope you are inspired by this unique approach to the classic and loved Rice Krispies® Treats. I hope your family has a very Merry Christmas. If you want to follow along to find more great things to do with Rice Krispies® Treats, make sure to follow them on Pinterest, Facebook and Twitter.